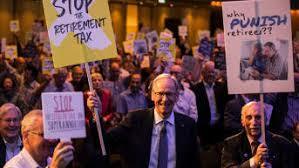 Hundreds of retirees were on Tuesday morning attending a Wilson Asset Management investor briefing, where small cardboard placards reading "don't tax us twice" and "stop the stealth tax on superannuation" were handed out. Wilson Asset Management's "franking credit roadshow" coincided with a hearing of the parliamentary inquiry in Sydney on November 20.he same time as of one his own six-monthly investor roadshows. I went to the local meeting yesterday. Remarkable growth story with investors - from sub 20 at Belconnen 4-5 years ago, packed out the QT Hotel with 200+. The older set packed in - no spring chicken myself, though hirsute, I felt rejuvenated ! As a love-in, there was much to endorse it; not that the WAM stable (WAM, WAX, WAA, WLE, microcap fund, global fund, plus FGX, FGG) totalling over $3bill is that differentiated from other LICs. Geoff W is the animated ringleader .... and therein lies huge key-man risk, as he is 66. ... shareholders have gathered in Sydney to protest Labor's plan to make franking credits non-refundable, a policy that is expected to leave one million retirees worse off. Veteran fund manager Geoff Wilson has been among those leading efforts to convince Labor to dump its franking credit changes. Mr Wilson told the gathering that the policy would "devastate the lives of a group of Australians". He encouraged the crowd to march on a public hearing of the House Economics Committee, which is inquiring into the implications of the proposed changes. The SMSF Association estimates that a million people will be affected even with Labor's "pensioner guarantee" carve out. Mr Wilson said the policy was inequitable and illogical because people with a part-pension on a certain date would still be eligible for refunds. Some have argued that retirees are too heavily invested in Australian shares because of the franking credit incentive. But Mr Wilson said investing in Australian businesses was good for capital formation. "They want to encourage you to invest overseas, which is more risky," he said. Mr Wilson told investors that the world had seen the top of the bull market. "Ã¢â‚¬â€¹We are nervous and we have increased our cash levels to reflect that," he said. "We like to be positioned for the worst and to hope for the best." Geoff Wilson might have just raised the biggest whack of capital in Wilson Asset Management's history, but the veteran fund manager wants his investors to know that he won't rush to put it to work. WAM will announce on Monday that the IPO of its first international equities listed investment company, WAM Global, has closed after raising $466 million. The oversubscribed raising is the biggest in the history of WAM's stable of funds, eclipsing the $392 million raised for its first large stock company, WAM Leaders. The firm had been targeting a $330 million raising for the WAM Global LIC. Almost 8000 of the investors in 13,000 WAM Global were existing shareholders in LICs across the WAM stable. Wilson said from New York that he was thrilled with the response from investors, who had been asking for WAM to venture into global equities for the past 10 years. "Now the challenge is to perform," Wilson says. WAM Global will start investing in the next week or so, led by lead portfolio manger Catriona Burns. But while Wilson emphasises WAM Global's capital pile is relatively small in the world of offshore investing, his team will be in no rush to put the whole pile to work; around 25 per cent to 30 per cent will be held in cash, and perhaps even more. This is wariness is driven by two things. First, Wilson is all too aware that the US in the midst of its third-longest bull market, which will become the second-longest in a month or so. 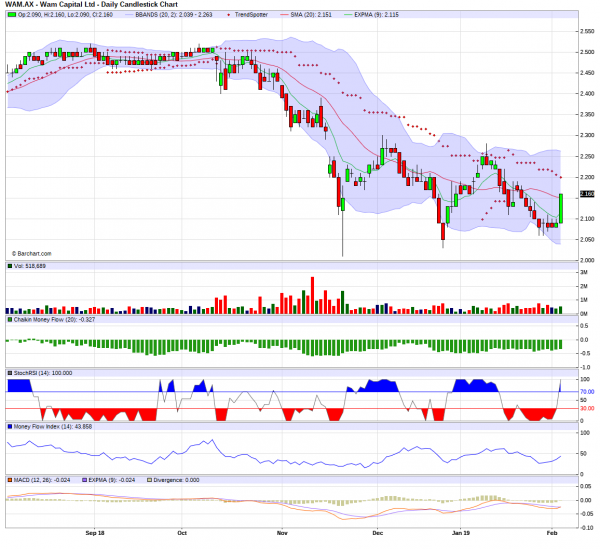 WAM would love to be buying undervalued growth stocks in a more volatile market, where opportunities can become cheaper. In addition, Wilson points out that the grand narrative of synchronised global growth has fractured a little since the start of the year, with ructions in Italy and some weaker-than-expected data from other parts of Europe creating some nerves. While Wilson says the mood in the US remains very upbeat Ã¢â‚¬â€œ except for all the businesspeople who he says start their conversations apologising for President Donald Trump Ã¢â‚¬â€œ he does have concern that the White House's tax cuts have effectively brought earnings growth forward by a year or so. "It's brought the growth forward. He's given the economy a sugar hit," Wilson says. With this in mind, WAM Global will factor into its investment decisions a view on how the US economy and the broader market might be performing in a couple of years. "Obviously it's very important that we are buying at the right time and buying when we can see a catalyst that's going to change a company's valuation," Wilson says. "But the exceptional opportunities come with significant dislocation. We are having minor dislocation, but we are still very wary of the market." While WAM Global should, on the surface, have a much larger universe of stocks to examine than with its Australian-focused LICs do, Wilson says the gap isn't as big as it might appear. In Australia there around 2500 listed stocks; in the US the number has fallen from around 8000 to 4300 in recent years Ã¢â‚¬â€œ something that Warren Buffett and JP Morgan's Jamie Dimon argue is due to the short-term focus of US markets, which they claim has "discouraged companies with a longer-term view from going public at all". Wilson says the remaining universe can be filtered pretty quickly to find the undervalued small and mid-sized companies WAM Global will focus on Ã¢â‚¬â€œ certainly don't expect them to be buying any FAANG stocks. The firm's four key filters Ã¢â‚¬â€œ earnings growth, valuation, industry position and management Ã¢â‚¬â€œ will be used by WAM Global, with Wilson putting an accent on the latter in a time when the royal commission has reminded him of the "decay of moral values" in business. fresh from the failed attempt to shoehorn into Hunter Hall (HHV) and deliver for the trouble, WAM and sister funds WAX and WAA, has announced a 5+% stake in another LIC, the chronically underperforming WDE (which should change its name from Wealth Defender Equities to Wealth Destroyer Equities). Whether 'pressure will be applied' to WDE remains to be seen; it is more than 10% below NTA and has been since listing. Eley Griffiths is not the only funds manager seeking to beef up its presence in microcaps. It is understood that local king of the listed investment companies, Geoff Wilson, is readying for a new microcap fund and already has the name "WAM Microcap Limited" under reservation with the Australian Securities and Investments Commission. While it is early days, stockbroker Taylor Collison is expected to be involved in the deal. Should the fund make it to the ASX, it would be the fifth in the Wilson Asset Management stable joining the flagship WAM Capital, along with WAM Research, WAM Active and WAM Leaders. Wilson also oversees another two funds as part of the Future Generation series. It comes as WAM is also in the process of recapitalising and taking over managing the ASX-listed Century Australia Investments, which is on track to be done in April. Microcaps seem to be flavour of the month, with existing small cap managers looking to utilise their stockpicking nous with specialist funds for smaller investments. The ideal scenario right now for high-profile fund manager Geoff Wilson from Wilson Asset Management is for another global financial crisis to hit. For him, that would be perfect. Nothing better. For sure, shares would be smashed, property too, as he thinks valuations for both those asset classes are on the very high side. But it would also mean he could start to spend some of the cash, as much as 42 per cent, that he has built up in his main fund. And there's nothing like a good crisis to help with a manager's performance. When stocks plunge 50 per cent or get sold down to a forward price-to-earnings ratio of one, as they did in the 2009, investors don't have to wait long for the rebound to pan out. If you get your timing right it can take two years to achieve returns that normally may take six years. Although almost half the fund is in cash, some of the top stocks in WAM Capital include Eclipx Group, Nick Scali, Ardent Leisure, Century Australia Investments, ALS, Helloworld, Southern Cross Media and Aristocrat Leisure. What worries Wilson now more than anything else, and a major reason why he holds so much cash, is how the world handles what he calls the great unwind. How, after years of easy money and falling interest rates, will global investors deal with a scenario that's never happened before? That is central banks taking away liquidity rather than adding to it. Ironically, for a value investor Ã¢â‚¬â€œ who likes nothing better than getting something on the cheap Ã¢â‚¬â€œ Wilson is betting that the end of this era, the end of all this cheap money, is now going to be a hindrance, not a help. The $US185 trillion credit-fuelled bonanza of the past 20 years has deformed the investment landscape in many ways so perhaps it's not surprising that eventually it creates a few problems when the trend starts to go the other way. The Bank of International Settlements has been warning about it for years, while countries such as Saudi Arabia, Qatar, Kuwait, and the UAE, that accumulated as much as $US2.3 trillion in sovereign funds over the past 20 years or so, now have to start selling those assets with deficits tipped to get to double-digit levels in the next few years. Rather than be concerned about a major meltdown, investors have pushed stocks up aggressively over the past two weeks since Donald Trump won the race to the White House. The resulting higher valuations will need to be justified by higher earnings and a durable rebound in growth. Value managers often like to see some irrational behaviour before they call the end of a bull market and maybe this post-election Trump buying, that has all four major indices on Wall Street at fresh record highs, is it. As John Templeton would say, bull markets are born on pessimism, grown on scepticism, mature on optimism and die on euphoria. The Dow Jones hitting 19,000 for the first time ever could be described as euphoric and it's certainly a milestone level for the blue-chip benchmark given the remarkable achievement has happened in response to a Trump victory. Investors have jumped on the tax cuts Trump says he'll bring in, but they have forgotten that he also wants to scrap trade deals, bring in big tariffs on China, break up big banks and audit the Federal Reserve. Any other time those sorts of promises would make investors very nervous. Then there's the ongoing worries about burgeoning budget deficits and the upward pressure on bond yields that also loom as a potential headwind for sharemarkets. All this is happening at a time when people are talking of a new era of lower returns, although it could also be more a case of lower prospects in the developed economies as they start to unwind the huge debt overhang. The American unwinding so far has been very tiny, and paying this back will create a drag on growth Ã¢â‚¬â€œ and on earnings and investment returns. But investors always have a choice when it comes to money: they can save it, or invest it. And since the bottom of the market in the March of 2009, if they have been fully invested in something like the S&P 500 price index, they have enjoyed an increase or more than 200 per cent over the past seven years. Can it really keep going? One of the worst kept secrets in the broking and funds management world is the game being played by those wanting to double guess the actions of well known fund manager Geoff Wilson from Wilson Asset Management. Wilson raised $394.3 million through an initial public offering; the new LIC, called WAM Leaders, will begin trading on the ASX on Monday. It will invest in the top 200 stocks with a slight twist. The pitch for financial planners and retail investors was that WAM Leaders would provide good returns while avoiding the top 20 stocks, which includes BHP Billiton, Rio Tinto and the big four banks. The game being played in the market revolves around trying to work out which stocks will end up in the WAM Leaders portfolio and then buy them ahead of Wilson. In common parlance this is called front running. Wilson reckons it is already happening judging from recent trading in Mayne Pharma, a stock that has been favoured by existing funds in the WAM group and was named in the promotional documents issued during the capital raising. Since May 19, the stock has risen 15 per cent to a record high of $1.56. Wilson Asset Management has finalised a raising of $394 million through its new listed entity WAM Leaders. The deal represents the largest-ever capital raising for an Australian listed investment company, and will look to find undervalued growth companies within the benchmark S&P/ASX 200 index. "From day one, we were overwhelmed with strong demand from investors, particularly from existing shareholders in our other LICs: WAM Capital Limited, WAM Research Limited and WAM Active Limited," Mr Wilson said. WAM Leaders is slated to hit ASX boards at $1.10 a share on Monday after it raised $394.3m through the allotment of 358.4 million shares in its IPO, with the raising drawing 10,000 investors. The group was able to upsize the raising on two occasions, with the initial top target of $330m comfortably surpassed. Director and chief investment officer Chris Stott said the record raising increased the opportunities available for the new fund. "Large funds under management ensures the relevance of the company in the market, which can increase investment opportunities," Mr Stott said. "It also has the benefit of lower fixed administration costs as a percentage of assets and greater liquidity for investors."